Cranberries – Cranberries offer a variety of health benefits. They are anti-inflammatory, help protect against urinary tract infections, help to support the immune system, and benefit the cardiovascular system. Dried cranberries are an easy and delicious addition to salads, oatmeal, muffins, or as a snack on their own. My Mom won’t eat a salad without them! Watermelon – Watermelon is rich in Vitamin A and Vitamin C. They’re a great source of lycopene which may decrease the risk of heart disease by decreasing cholesterol. Enjoy fresh watermelon anytime of the day as breakfast or as a dessert. Another idea is freezing chopped watermelon pieces and blending it for a frozen treat. To me, watermelon is the definition of summer. 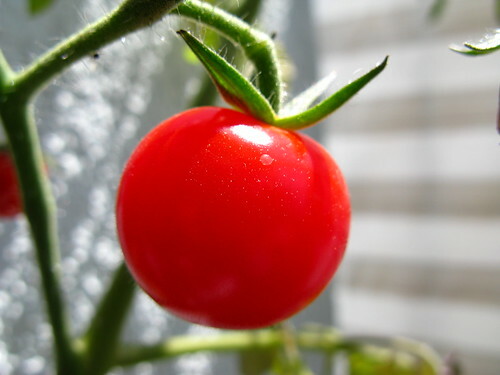 Tomatoes – Tomatoes are an easy, healthful add to a diet. As with the watermelon, tomatoes are rich in lycopene. Tomatoes are also rich in Vitamin C, Vitamin A, and Vitamin K. The Mayo Clinic describes the benefits of tomatoes: “Numerous studies correlate high intake of lycopene-containing foods or high lycopene serum levels with reduced incidence of cancer, cardiovascular disease, and macular degeneration.” Add fresh tomato to any sandwich, wrap, salad, or eat it on its own. Tomatoes can be used to make pasta sauce, bruschetta, salsa, and ketchup. If you don’t care for the taste of raw tomatoes, try chopping them into smaller pieces. You might not even know they’re there. Red Pepper – Red pepper is a great source of Vitamin A and Vitamin C. Red pepper is delicious in salads or sliced into pieces and eaten raw. I also used a red pepper in my chili (recipe soon to be posted), stir-fry, and burritos. Beets – Beets are a good source of Vitamin C, Iron and Magnesium, and a very good source of Dietary Fiber, Folate, Potassium and Manganese. Beets can be juiced, cooked, pickled, and used in soups and stews. These are a few of the great red foods that benefit your health and taste buds. What are your favorite red foods? Do you have any recipes that utilize these red jewels?